Since V-day is tomorrow, here’s a “looks like I spent a lot of time in the kitchen making this, but I didn’t really” meal to serve your loved one! I love sending these finished pics to B to make him believe I spend a lot of time in the kitchen creating these fancy meals in hopes for a race entry or maybe a new pair of shoes. It never happens because he knows I will just buy them anyways with my own money in due time (ie previous post). Since I was getting sick of eating chicken and beef for every other meal, and fish is so good for you, I decided to pick up these beauties of tilapia fillets at the market and make this simple Mediterranean inspired dish with them. 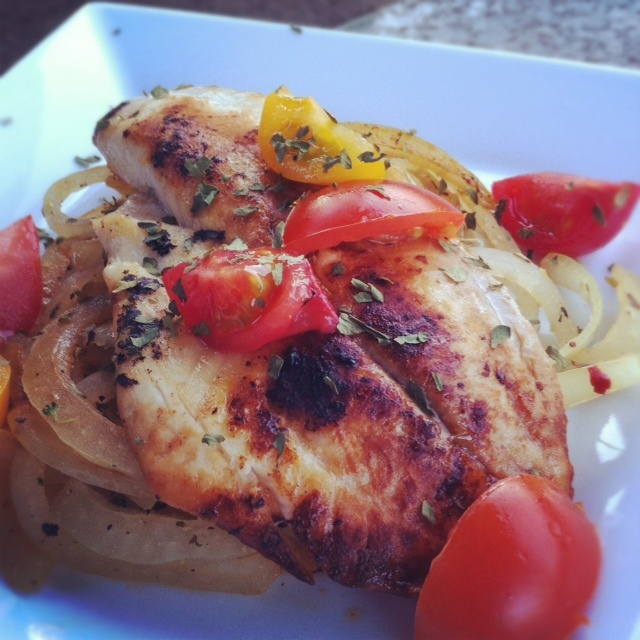 Tilapia is very mild in flavor, unlike salmon which can be a hit or miss with some people. I like to buy white fish whenever I can, but halibut and mahi mahi are just too expensive to enjoy every week. Tilapia is also great to cook with since it takes on the flavor of whatever else is in your dish. I served mine on a bed of sauteed veggies and a side of cauliflower mashed potatoes. You can never have too many vegetables in one dish! PS-B and I will be spending our V-day working and running track, respectively. Que romántico. 1. Start by heating a tablespoon of olive oil in a non-stick pan. Season the fish with salt and pepper. Once pan is hot, cook fillet 3 minutes on each side before flipping.The fish cook really quickly depending on the thickness so make sure you don’t end up overcooking it. 3. Plate onions on the bottom of the plate with a piece of fish on top. Garnish with the tomatoes, capers, olives and parsley.